Since 2007, I-Tero has led a revolution in 3D digital dentistry. 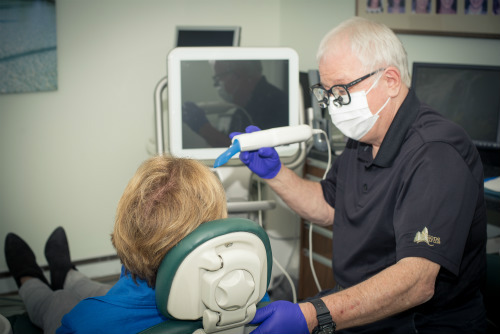 Traditional dental impressions are replaced with highly accurate digital images. This means that the patient does not have to endure the “goopy-gaggy” impression material to have restorative work completed. And what’s even better, is that these digital images give state of the art information to the dental labs, creating restorations that fit beautifully. This is all done by gliding a tiny camera over the teeth and scanning pictures of every angle of the tooth to be restored. These 3D images are forwarded to the lab through the internet instead of being sent through the mail or being Fed Ex’d and the restoration is developed from those pictures. This creates a better system as it eliminates many sources of distortion and helps us create beautiful restorations that fit perfectly and require less adjustment. Dr. Poupore has had this innovative technology in his office for 8 years and recently purchased an updated version that, once again, has many improvements and is even more accurate than the original version. The patients love it, the lab loves it and of course the Doctor gets the best quality from this technology.